The Consumer Financial Protection Bureau has already clamped down hard on banks for working with dealers to screw customers — specifically, to overcharge people because they're not white. Now the CFPB is hoping to regulate dealers directly in order to protect all consumers, with this proposed change that would allow them to do so (currently they can only deal with the financial institutions). 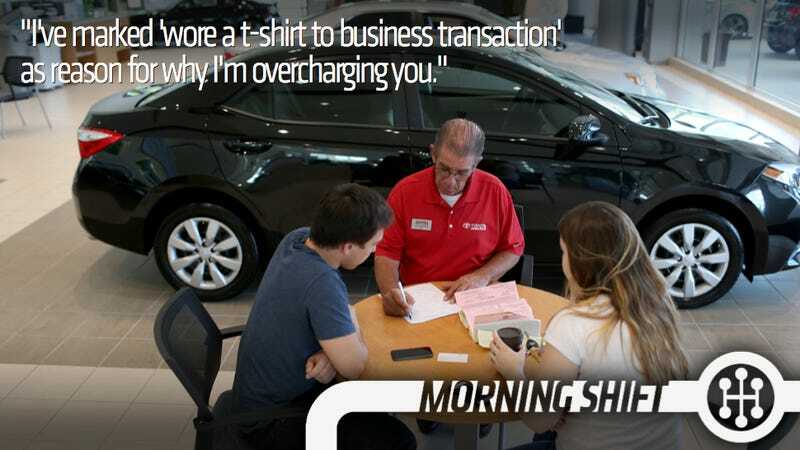 McConnell on Tuesday argued that customers would pay more under a flat-rate system. I'm with the CFPB on this one, but the dealers are a strong lobby and they've already got a bipartisan bill to remove the ability of the CFPB to give any guidance on auto lending. Fiat Chrysler CEO Sergio Marchionne says he's outta here after the end of 2018, which will time out with the end of his grand five-year plan. Possible replacements are many, but I'd bet on a European. Also, it's Marchionne we're talking about here, so who knows if he's actually gone in 2019. Here's a recall that's kind of disturbing : 7,061 Caprice cop cars might just shift out of park and into gear without hitting the brake pedal or might shift between gears while showing a different gear. According to the Freep there have been no injuries and the company is sending out a kit to fix it. The company said the vehicle&apos;s display panel may show the wrong gear. GM didn't change their profit outlook in the same way Ford did so Morgan Stanley just did it for them. GM executives said last week they seek profitability in Europe, higher margins by ’16. Someone deliver an aloe vera plant to the Renn Cen because THEY JUST GOT BURNNNNNNNNNNED. The Gigafactory is coming and Panasonic is in with "tens of billions of yen" right now. In a call with investors in July, Tesla founder Elon Musk said he expected Panasonic to contribute 30%- 40% of the battery factory’s total cost, likely to reach $5 billion. Tesla will cover about half the amount. The dollar was trading around ¥109.12 early afternoon in Asia. Yeah, I don't think thats as "separate" as it seems. For one, the weaker the yen the more of it you're going to have to spend to reach the $2 billion or so you're planning to invest. Plus, if the yen is going to continue to drop relative to the dollar it's best to send them elsewhere as soon as you can. On this day in 1869, the inventor and mechanic Frank Duryea is born on a farm in Washburn, Illinois. When Duryea was just 24 years old, he and his older brother, Charles, designed and built the Duryea Motor Wagon, one of the first successful gas-powered motor vehicles in the United States. Neutral: CFPB Versus Dealers, Who Wins? Who should win?